TOTAL SOLAR ECLIPSE BLOCK PARTY ! Totality of the 2017 Great American Eclipse. It is the moment we’ve all been waiting and working toward. An estimated 10,000 people filled the streets in Downtown Franklin, North Carolina for the Great American Eclipse of 2017! At 2:30 pm traffic was stopped to allow everyone to fill Main Street, literally from one end to the other, to see this spectacular event. Guests came from as far away as California, New Hampshire, Maine, New York, Virginia and Florida (to name a few) AND even Venezuela! Mayor Bob Scott, Town Manager Summer Woodard along with the staff and employees of the Town of Franklin can honestly say it was one our most memorable moments EVER to spend this historic occasion with several thousand new friends! My name is Elena Pavlova. I am from Moscow, Russia. I've also visited Franklin to see the full solar eclipse. You can report about it on your web site. I think it will be an interesting information for everyone. Thank you! This was our first time in franklin and my family and i loved visiting such a beautiful little town! Me and my husband are planning a trip back to franklin very soon to check out all the local shops. Thanks for such a memorable event from Oak Hill WV! We traveled from Michigan and are very happy that we chose Franklin. We had a great time! Thank you, Franklin! We were visitors from Ohio today. It was a pleasure to enjoy the eclipse in such a beautiful and welcoming community! Great experience! Thank you so much, Franklin! Ya'll were awesome and so welcoming. Thank you from Baltimore, Maryland. Fabulous job, Franklin!! Worth coming down from State College PA. Congratulations to everyone! I was there from Raleigh and had a great time. Thanks for your hospitality! Kudos to a job well done! We drove down from New Hampshire for the fun, and this FB page and the town website were the reason we picked Franklin. Thank you so much for opening your town to us. Excellent atmosphere and hospitality. Well done to the planners and all of the businesses that opened to serve the crowds! Thank you Franklin! We drove in from the VA coast, were pleased and impressed with the preparations you'd made for all of us. Activities for the kids, allowance for parking, street closed off, extra food and the all-important potties; tolerance for what must have seemed like a plague of locusts (10k tourists all at once) - thanks again! At 2:35:18 pm on Monday, August 21, 2017 the countdown began. 10 seconds to totality of the Great American Solar Eclipse in Franklin, North Carolina. 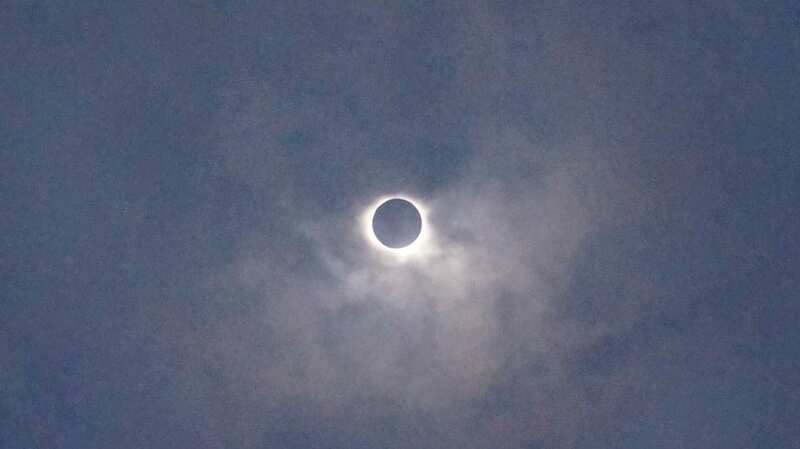 At 2:35:28 pm totality was greeted by a deafening cheer from the estimate 10,000 in attendance that was heard literally across the Town of Franklin. 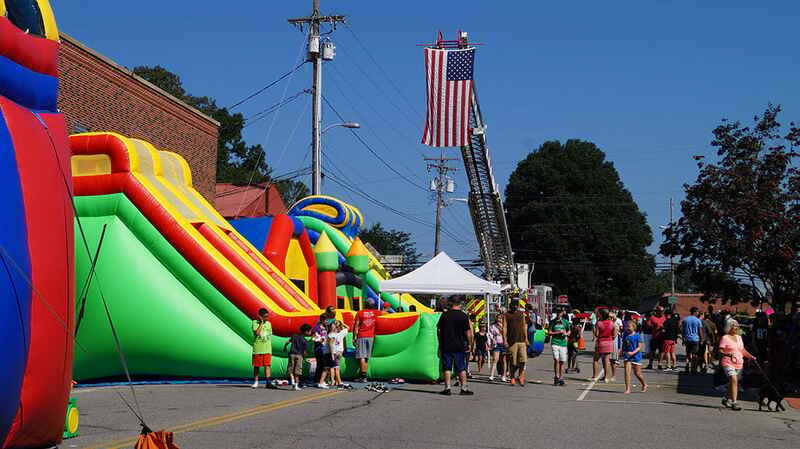 Hundreds of youngters had a blast in the KId's Zone on the Square in Downtown Franklin, North Carolina. One of the most popular attractions was the 18 foot high, 50 foot long slip n' slide that cooled them down on a hot August day. The Town of Franklin offered official souvenirs of the 2017 Total Solar Eclipse as well as a location for giveaways. The first 100 guests were treated to a free Moon Pie & Ice Cold RC Cola. 2,000 pairs of eclipse glasses and two pairs of EclipSmart Binoculars were also given away. 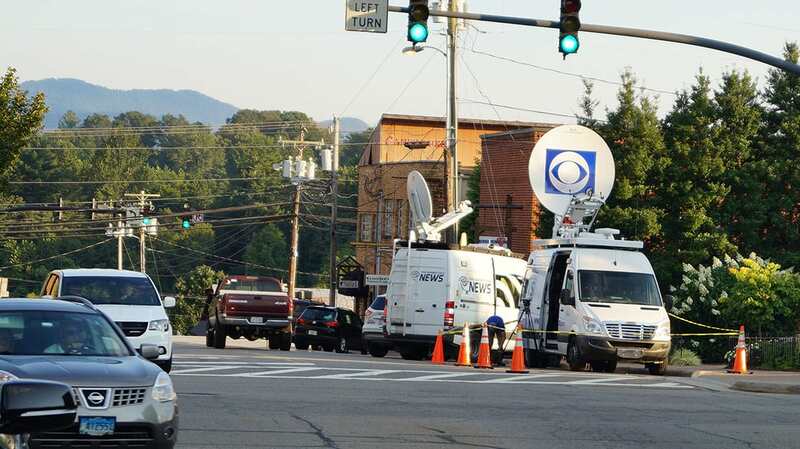 CBS North Carolina’s chief meteorologist Wes Hohenstein and reporter Michael Hyland began their coverage on Sunday after in Franklin, NC. It was certainly a pleasure to host the television station and crew from our State Capitol of Raleigh! 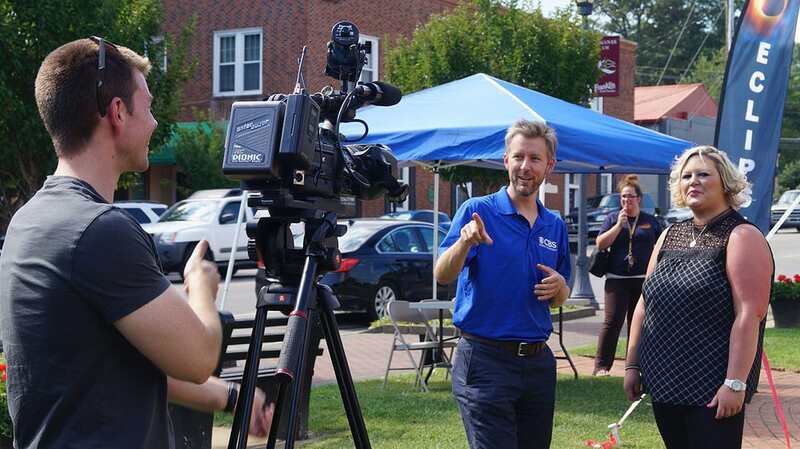 Jonathan Lowe and Spectrum News from Charlotte, North Carolina also began their coverage on Sunday. 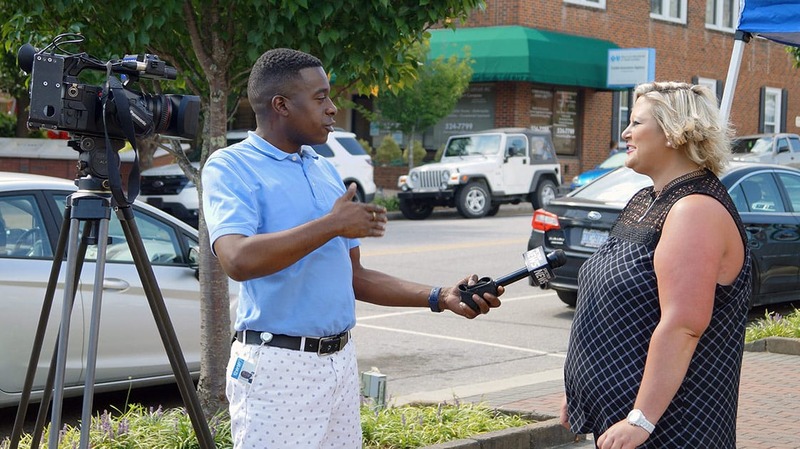 Jonathan is shown above interviewing Franklin Town Manager Summer Woodard. 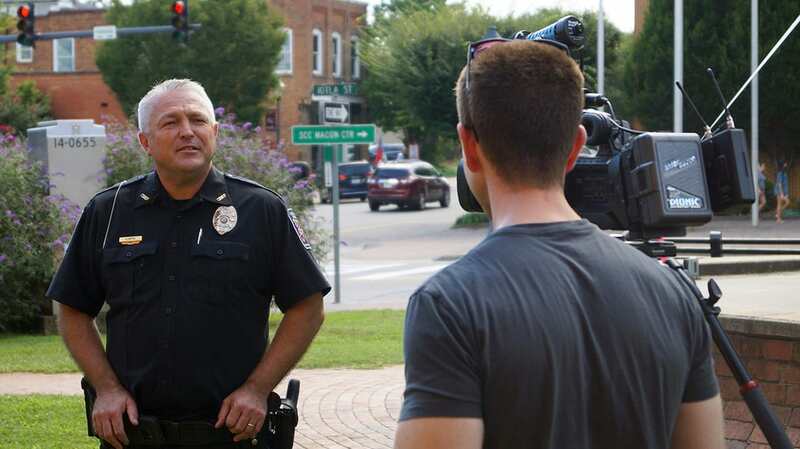 It was certainly a pleasure to have Jonthan and crew in town to cover this historic event. 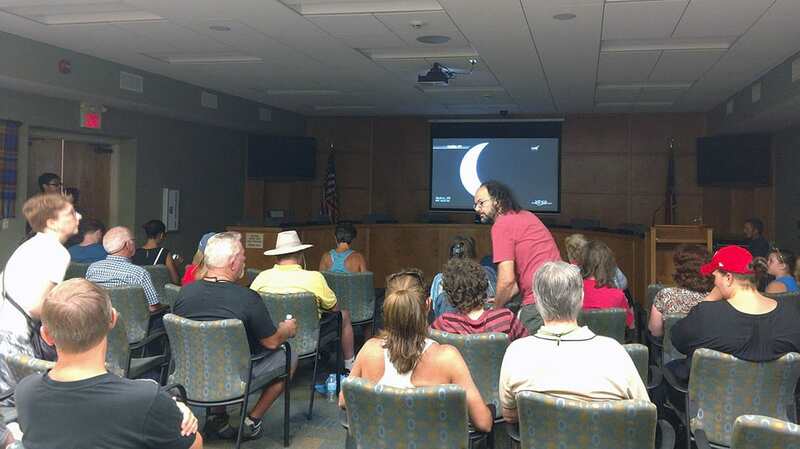 The Town of Franklin, North Carolina Board Room was busy all day with visitors taking in the 4 hour NASA live broadcast of the Great American Solar Eclipse. The live broadcast took place from 12 noon to 4:00 pm and followed the Eclipse from its entry into Oregon and ended with shots from a ship based in the Atlantic Ocean. 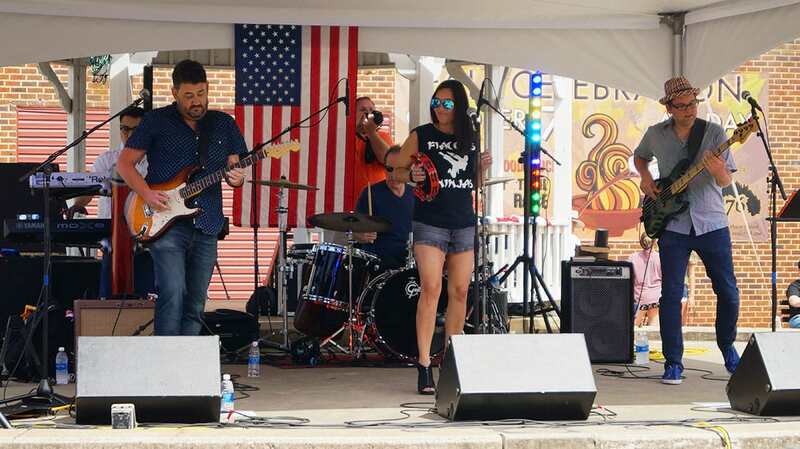 Last Five Standing from Atlanta, Georgia was featured in a two hour post-totality concert at the Gazebo on the Square in Downtown Franklin. Their set list included hits of the 80's, 90's and today. The crowd on hand danced the afternoon away as the celebration continued in Franklin, North Carolina.